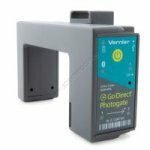 The Vernier Go Direct Photogate is a double-gate sensor that includes two photogates built into the sensor arms to accurately measure velocity and acceleration. It connects via Bluetooth® wireless technology or via USB to your device. With Vernier's Go Direct Photogate students are able to easily and precisely measure velocity and acceleration to study the movement of an object in free fall, rolling objects, collisions and pendulums, without needing to know anything about the geometry of the object. 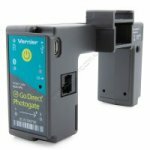 Vernier Go Direct Photogate also includes a single laser gate for use with objects passing outside of the arms of the sensor. Using the laser gate requires a visible-light pen laser (not included). NOTE: Vernier photogates have an electronic timing resolution of 1 microsecond but typically get measurements with only +/-25 millisecond accuracy due to variations in optical-response tolerances of the photodiodes and the geometry of the object relative to the path it takes through the photogate. When using multiple Vernier Go Direct Photogates connected wirelessly students will typically get measurements with +/-35 millisecond accuracy. This 10 millisecond difference is associated with the initialization of multiple device clocks when starting data collection. Two Vernier Go Direct Photogates daisy-chained together do not experience this added error as they are utilizing a single clock.